With the recent passing of National Women’s Health Week, your family dentist in Eugene thinks it’s important to discuss an aspect of women’s health that often gets overlooked during pregnancy – their oral health. It wasn’t long ago that oral health professionals were discouraged from treating pregnant patients. But in recent years, guidelines established by the American College of Obstetricians and Gynecologists placed a renewed focus on the importance of maintaining quality oral health during pregnancy, improved dental techniques that made care safer for pregnant patients, and the benefits receiving dental care during pregnancy offers both the mother and child. Additionally, dental schools are now teaching and reinforcing the importance of treating pregnant patients. A mother that suffers from poor oral health has a much greater chance of transmitting harmful oral bacteria to her baby, even when that baby doesn’t have any teeth. Not only can poor oral health during pregnancy impact a child’s oral health development, it can also negatively affect the pregnancy itself. Here are a few things for expectant mothers to consider when it comes to receiving dental care during this important time. A woman’s oral health can impact the outcome of her pregnancy. Studies have found links between preterm birth – or babies born too early – and periodontal infections. However, researchers have found no evidence to suggest that pregnancy outcomes actually improve with more oral health care. Preventing chronic inflammation and maintaining quality nutrition are other important factors a woman must consider while pregnant. But one of the easiest ways to lower risk for certain health conditions is by maintaining quality oral health. Poor oral health for a pregnant patient could be linked to birth complications like low birth-weight, pre-eclampsia, and preterm birth. This makes it extremely dangerous for a woman to neglect her oral health before and during her pregnancy. Studies have shown that receiving dental care – whether having a tooth pulled, filling placed, or just a routine cleaning – is completely safe during pregnancy. In fact, the majority of dentists and obstetricians now actually recommend dental care during pregnancy, a shift in thinking from just 10 years ago. Even dental x-rays and the use of local anesthetics are entirely safe when the proper protections are used. Hormonal fluctuations during pregnancy dramatically increase a woman’s risk of gum disease, a condition known as “pregnancy gingivitis.” As a result of fluctuating oral health, it’s important that in addition to receiving regular dental care, pregnant patients also practice quality oral hygiene at home. 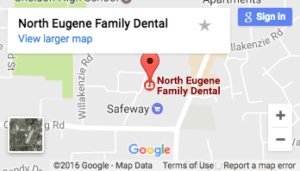 In addition to brushing and flossing after every meal, pregnant patients may even need to receive additional dental care if deemed necessary by your family dentist in Eugene. Pregnant patients should also never delay receiving treatment for an urgent problem, such as chronic oral pain or a fever. While some number of oral health changes inevitably occur during pregnancy, it’s important that pregnant patients understand what’s normal and what’s not. Additional gum sensitivity or tenderness, for example, is fairly common, while losing a tooth is not. Increased food craving and snacking that often occurs during pregnancy carries the risk of causing more cavities, nausea and vomiting, and gum sensitivity. Vomiting causes stomach acid to rise up into the mouth. Frequent exposure to stomach acids can slowly erode tooth enamel, increasing a woman’s risk of decay and disease. Brushing should actually be postponed for at least an hour after to vomiting to minimize the risk of dental erosion. Despite this potential issue, it’s still important that pregnant patients practice quality oral hygiene daily.